Richard Irwin (Belper, United Kingdom) on 7 March 2008 in Animal & Insect. 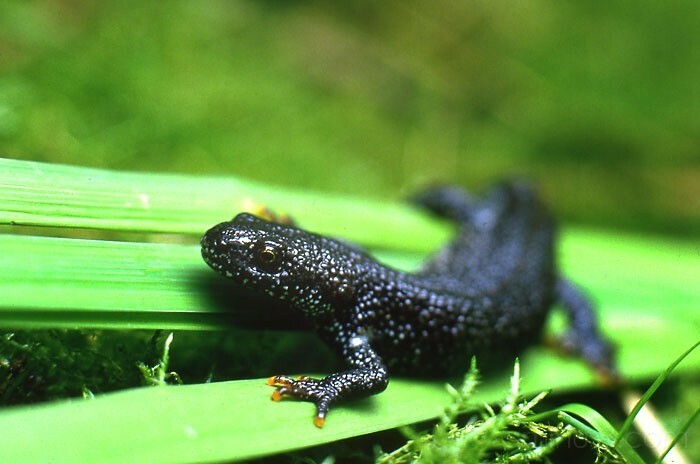 A very rare species here in England, I photographed this beautiful Great Crested Newt in a conservation area I was working in as a Contryside Ranger. Wow, incredible! Not only the detail, but the brilliant green that sets off the creature. Whos' this now? Scary I must say. Great shot. @Sujit Sudhi: Thanks. These little newts are perfectly harmless. They are very rare, and are protected. Excellent shot! Wonderful detail in the newt. This is a great series. You've captured not just the appearance but I feel something of the personality as well. The DOF has been very effective in this series. I'm really impressed with the variety of creatures you've snapped here Richard! Is this series inspired by Attenborough's latest...? @Daroru: Ha ha, you guessed it absolutely. Loved every episode, and so I just had to pay homage. Wow a fantastic capture Richard and great DoF! Creepy little fellow hi is though. The sharpness and colors are wonderful. nice detail and dof, the capture is impressive. Great capture, Richard. Love the detail in that front leg! Beautifully seen and taken, Richard!! The dof and colour is gorgeous!! And a most gorgeous little creature he is too. I like the contrast between the lizard and the backgruond! How fabulous, wonderful find Richard, you must be thrilled!